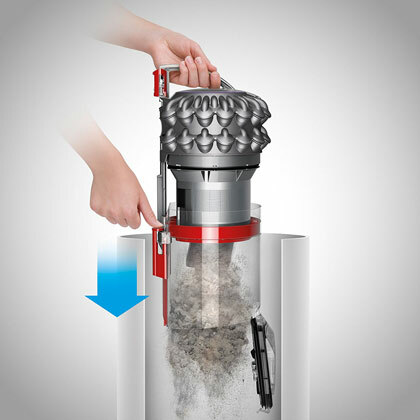 The Dyson “Big Ball” Cinetic Animal canister has updated to Dyson Cinetic™ science technology (using 36 cinetic tips) to increase suction power and dirt separation and eliminate the need for filters. The Cinetic “Big Ball” canister features a Triggerhead™ Tool, with an air-driven rotating brush bar which can be turned on and off (for delicate rugs, and hard floors) from the handle, so no bending down required. With its strong suction and tools, the Multi-Floor Canister is ideal for removing pet hair. Dyson’s new lightweight canister ball vacuum is ideal for those who want a powerful vacuum that doesn’t lose suction, but also don’t want to have to work with a heavy floor-cleaning machine. Equipped with Dyson “Big Ball” technology, this canister vacuum cleaner sits on a ball for easy twisting and turning around furniture and obstacles. This version is great for pet hair. The Dyson Ball Cinetic is Engineered for reduced noise levels by using sound insulating materials, and sound dampening mounts. The Dyson Cinetic Animal Multi-Floor Canister has an ergonomic handle for easy vacuuming, as well as a wand which allows you to reach for stairs, drapes, upholstery, and more. You can turn off the brush bar from the handle for delicate rugs and bare floors. Easy retractable cord rewind. Total reach from the power outlet is 35 feet. HEPA filtration prevents dust and dirt from polluting the air while you are vacuuming. Hygienic and quick to empty: just press the button and avoid contact with the dirt. 21.7 foot power cord. Includes a 5 year warranty. The Articulated handle now rotates in three directions, allowing full 360° articulation for greater control. Easy bin dirt & dust disposal (empties from the bottom), and new dust ejection feature. Self Righting: Self rights after toppling. If your vacuum topples over, it automatically self rights itself. Dust Ejection System: This new feature works by scraping clean the screen and pushing all the dirt through to the bottom when emptying into the trashcan. This prevents most of the dust from sticking onto the surfaces of the bin. This feature was first seen on Dyson’s V8 series cordless vacuums. Dyson Cinetic Canister Features: The Dyson Cinetic Animal Canister version includes the fantastic “Tangle Free” air-driven Mini Turbine Tool to clean upholstery, cars, and stairs of dust, dirt, and pet hair. It will not tangle like traditional hand tools. This Animal version includes 4 extra tools, a stair tool, mini turbine tool, stiff bristle brush (for ground in dirt), and a combination tool. Smart-Review Commentary: The Dyson Cinetic Canister is Dyson’s best canister vacuum. Dyson Cinetic technology with its HEPA Filter captures microscopic pollen, mold, and bacteria so that you don’t breath in what was in your carpets. Cinetic technology eliminates the need for filters using 36 cinetic types which vibrate out the dirt and dust. 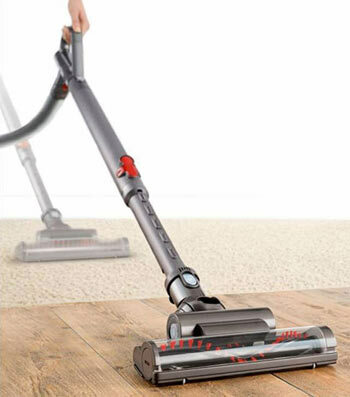 This vacuum is suitable for those with allergies to dust and mold. New features include a Dust Ejection System which scrapes clean the screen and pushes dirt and dust out. Also added is the self righting feature which will automatically put your vacuum in an upright position, should it topple over. The Triggerhead™ brush bar helps remove deep down dirt and pet hair from carpets, while the ball technology allows you to effortlessly move the vacuum around furniture and other obstacles. The dust bin is detachable, and empties from the bottom into the trashcan, to keep the dust and dirt contained. The wand and hose give you a long reach to clean stairs, walls, drapes, and ceilings. Dyson has made this model quieter, by using sound insulating materials. This model is great for picking up pet hair and it comes with the Tangle-Free Mini Turbine Tool for getting pet hair off of upholstery and car interiors. If however you want the mini turbine brush option, you can buy the Dyson Cinetic animal version listed below. This model has received extremely high marks from professional reviews as well as outstanding reviews by consumers. The Dyson Big Ball Cinetic canister is not only a Smart-Review top pick, but has won our BEST of 2018 award for bagless canister vacuums. Included “Tangle-Free” Mini Turbine Tool – Most good pet vacuums include an air driven turbo or turbine tool to remove pet hair, dirt and dust from smaller areas inaccessible from the vacuum. This would include vacuuming upholstery, chairs, stairs, beds, car interiors, and other smaller areas. 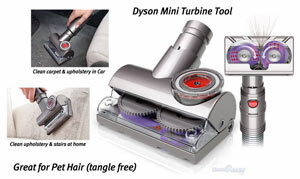 Dyson has designed what we consider a superior “tangle-free” turbine tool, that removes long and short pet hair, threads, ribbons, shoelaces, strings and other hazards without tangling, as it has no beater bar for hair to wrap around like traditional turbine tools (see video on left). 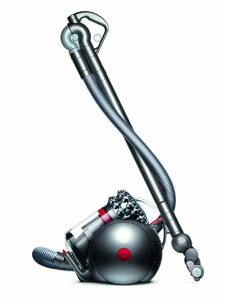 Description: The “Big Ball” Cinetic Animal Canister Vacuum has powerful suction. This is the top-of-the-line Dyson canister vacuum. Included with this vacuum is a handheld tangle-free pet tool for use on stairs, smaller areas, upholstery, and car interiors. An air driven Triggerhead™ Tool allow you to vacuum hard floors or carpets, and it can be shut off. Retractable cord rewind for your convenience. This model is a SmartReview BEST of 2018 award winner.